The Industry leading QwikStrips are an interproximal solution for removing cement from in between teeth and also for creating the precise spacing needed (IPR) for minor tooth movement. The challenge of removing cement after cementation of crowns, inlays, onlays and veneers has been answered. 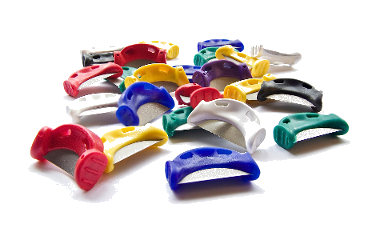 QwikStrip™ serrated strips were designed to make clean up simple and safe. The depth limiting design prevents soft tissue injury, while the unique handle provides a comfortable grip for optimal tactile control, giving doctors easy access to interproximal spaces. Cutting of the patients’ lips or gums is a thing of the past with the firmly embedded strips. QwikStrip™ abrasive strips provide the ULTIMATE solution for doing IPR. Whether doing Invisalign™, 6-month Smile™, Clear Correct™, MTM™, or any other orthodontic treatment, simply follow the color coded sequence guide for achieving the precise interproximal reduction needed (IPR). QwikStrip™ abrasive strips are available in three styles: Single-Sided, Double-Sided, and a revolutionary Curved version. When needed, QwikStrip™ superfine strips can also be used for simply smoothening any interproximal restoration, or for relieving the friction (heavy contact) prior to seating crowns, veneers, inlays or onlays. Check the contact, adjust with the QwikStrip™ superfine strip, and then seat the restoration. It’s that easy! Hygienists, hold on! Try using the QwikStrip™ (straight or curved) super-fine strips for removing tough stains that your instruments can’t reach. You will never want to be without QwikStrips by your side! In order to create precise interproximal spaces for any Orthodontic procedure or any Minor Tooth Movement needed, use QwikStrip™ color coded abrasive strips according to the sequence outlined. The reduction process (IPR) should begin with the white serrated strip (not pictured) to break the contact, followed by the yellow single-sided strip (.07mm), and continue in sequence until the desired space is achieved. Check the reduction with an approved measurement guide before moving to the next strip (grit) in the sequence. Note: Use all versions of QwikStrips (single-sided, double-sided, and curved) in any area of the mouth. 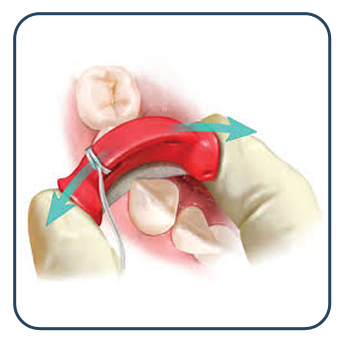 In order to achieve optimal results and for maintaining the proper anatomical contour for posterior teeth, finish any IPR procedure by using the curved QwikStrips. Fear IPR no more with QwikStrips! FDA approved and made in the USA. Contact us at info@qwikstrips.com for any information. *The inventor of QwikStrips is a dentist who understands the challenge of creating the exact amount of space needed while performing IPR procedures. Having over 27 years of experience, Doctor Khouri is proud to offer Qwikstrips to all of his colleagues.